Disclosure: some of the links below are affiliate links. If you purchase a linked item, I will made a commission, at no extra charge to you, and will be grateful for your support! When I was younger, I never sent out Christmas cards. I wasn't sure who I'd send them to, and, most frustratingly, I had no idea what I'd put on them, since we had neither kids nor pets, nor did I necessarily have any images of the two of us that I wanted to include. ​As I hit my mid-20’s, I started receiving quite a few holiday cards from coworkers, family, friends from college and law school, etc., and felt badly not reciprocating. I got so excited when one came in the mail or arrived on my desk, yet I did suspect that if I didn't reciprocate, they might stop coming. With some encouragement from my boss, I made the leap and started sending them out from just my husband and I. For me, Minted worked perfectly - they have unique products with clean, modern designs that can be individually personalized (with very little effort from me). It's quick and easy to narrow selections based on the holiday message (Happy Holidays, Hanukkah, Christmas, New Years, etc.) and whether you want to include a personalized message. ​Check out some tips and tricks for making your own cards this year! For me, this was the hardest part, until I finally made the leap: Pictures of yourself (certainly can be, but) do not have to be the entire focus of a Christmas card. Friends and family want to know what's been going on with you this past year - it doesn't have to be conveyed by a picture you took! If this isn't a year where you can feature a good photo, go with a postcard format. You can use a Minted design on the front, and include your own, small picture on the back (or not). Our first Christmas card, which I loved, featured a change of address, since we had just moved. Or, if you are newly married and looking for something to do with all of those wedding photos, Minted even has an entire section of Newlywed Holiday Cards. Though I'm never short on things to say, I like to keep it simple on the Christmas card. This is why I like the postcard style - very little is required, aside from "Happy Holidays!" and your name. If you want to say more, focus on big events - new jobs, new home, new pets! And if you really don't have anything to say, Minted will reformat the card so that there isn't a big blank space begging for text. Family, friends, college friends, colleagues at work (you can just leave them on desks, if you don't want to bother with addresses), and even former colleagues (that's one of my favorites). I regularly send cards to people who do not reciprocate, but who often tell me how much they appreciate receiving them! 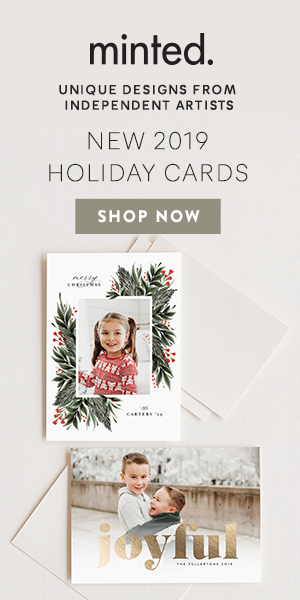 Minted will even address the cards/envelopes for you, if you enter the addresses into the website. Additionally, one of the best features of the site is that you can type in the addresses and save them for next year. This is definitely what keeps me going year after year - Minted addresses 3/4 of my order with my addresses and I just order a few blank ones and address some by hand for new additions to the list! I have our return address put on all the cards, which saves a ton of time. Also, rather than having to keep a stack of address changes, etc., I can update the addresses in the website throughout the year as people move. The earlier the better. I aim to order right before Thanksgiving and send them out right after. That way, you'll get some in return if you hadn't been sending them before. However, if you're missed that window, Minted can get them to you shockingly quickly. If you end-up missing Christmas, there are always the shiny New Years cards! My Grandmother was so diligent about sending out Christmas cards, and she always got piles in return. I sadly let it all slide when I had young kids and never got back in to it. You have given me food for thought! I thought xmas cards were becoming a thing of the past. My mum still sends them religiously each year though. Personally I never reciprocated any I received and maybe that’s why I don’t get any anymore. I do like your design of your cards. Very beautiful.